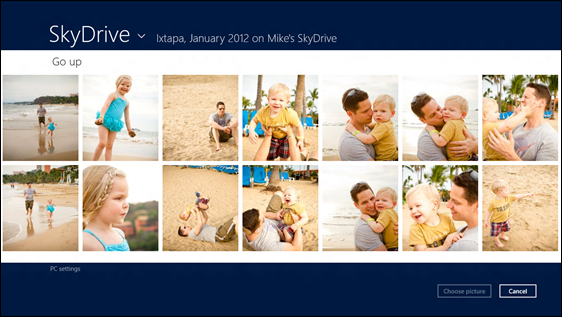 Microsoft has announced that it will integrate its cloud storage service Skydrive with the upcoming Windows 8 operating system. "It is a Metro UI based application that allow users to access and browse remote files from the web via a fast and fluid touch based interface"
and browse files via a fast and fluid touch based interface. Microsoft intends for SkyDrive to "evolve with Windows 8 from a website today into a true device cloud for Windows customers," Mike Torres and Omar Shahine, group program managers for SkyDrive, wrote in the post. "With Windows 8, we wanted to make sure that your files would be instantly available and up-to-date as you move between PCs--without configuring add-ons or using a USB drive." The desktop app will allow "easy drag-and-drop upload and download support for SkyDrive, anywhere access to your data, offline access, and the power of Windows Explorer to manage your files and folders."